For someone who doesn’t like cold weather, I sure do seem to go on about how much I love layering. 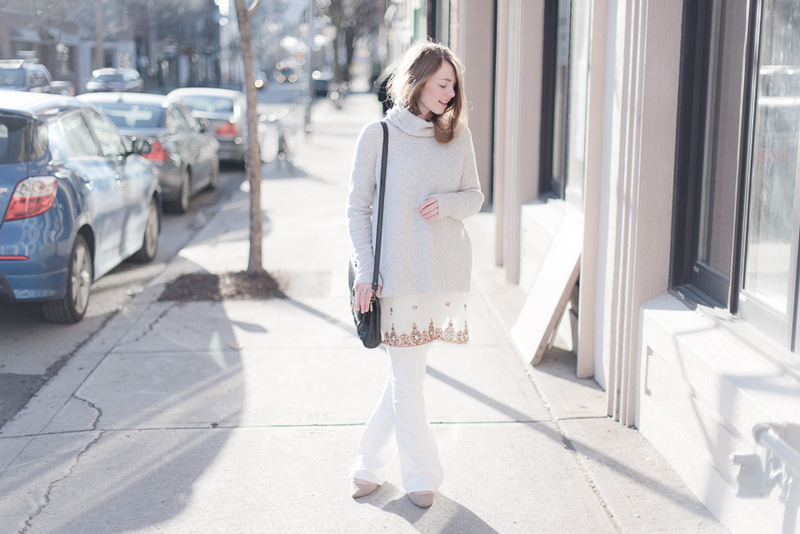 This touch-of-sparkle outfit is an outcome of my go-to layering formula (you may remember it from this post over here). Instead of the slipdress I’ve layered over my summer flares and instead of a classic shirtdress I’ve added this vintage beaded tunic. But it all comes from the same outfit formula that I keep in my back pocket. You probably already have your go-to formulas—whether it’s a full skirt + tight top, a looser top with a cinched-waist, a tunic with knee-high boots—they don’t need to be complicated or exceptional, but they do need to make you feel exceptional when you wear them! Safe experimentation is how I get regular wear out of this beaded number. Sparkles are a little out there for me—so I rein them in by mixing them into my tried and true formula. What about you? What are your go-to formulas? And how can we add a splash of adventurous to them this holiday season? Today's post is to encourage you to mix in that piece that's a little "out there"—that piece you never wear—into your go-to formulas. See what exceptional outfits are already waiting in your closet! So glad to have you join in, love! Now head on over to your inbox—and maybe even your sneaky spam folder—to confirm!